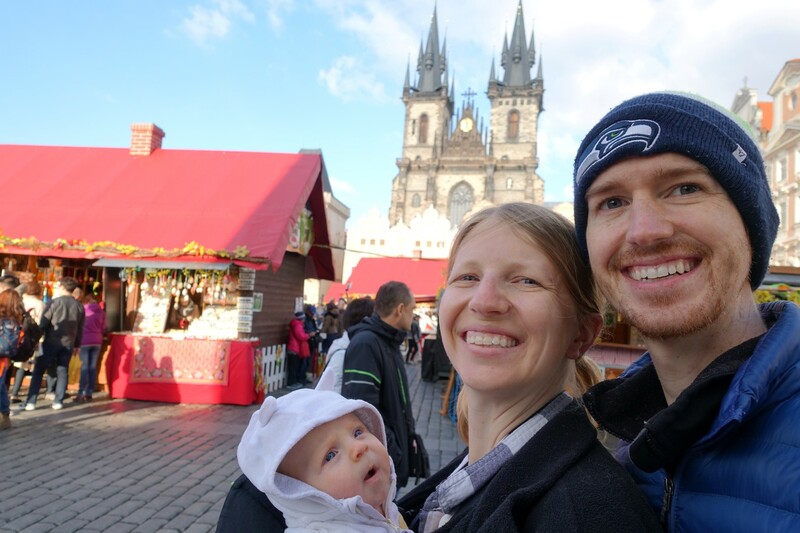 Once the housesit was over, we made our way over to Prague to stay for a month. On our backpacking trip way back in the day, we spent just a day in Prague and have wanted to go back ever since, and this seemed like the perfect time. Prague is awesome. Every single building is beautiful and interesting, and we spent most of our time just walking around enjoying the sights. Annabelle loved taking naps in the Baby Bjorn while we walked, so it was a good way for her to get some rest and us to get exercise. Joe, Ali, and Annabelle at the Easter markets. When we first arrived, we got to experience some fun Easter market shenanigans, full of festive shops that were pleasant to walk through. Later on, we had some nice long walks to a hospital for Annabelle’s vaccinations. We even managed a fairly long walk to hit a cool farmer’s market. It seemed like there was always someplace cool to explore while we were there. 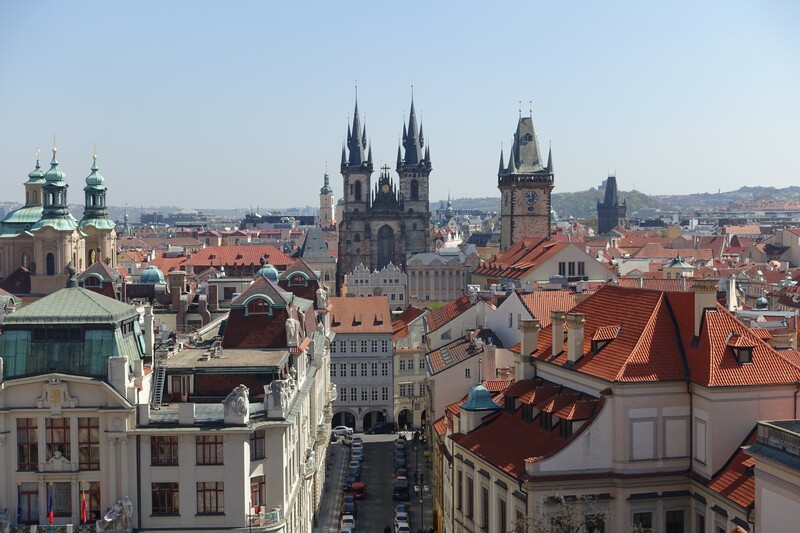 Our walks often took us to Charles Bridge, Prague Castle, and the old square, where you can find the astronomical clock and that fancy church you see in all the Prague pictures online. A lot of the time, we would just walk along the river and enjoy the views from there, but sometimes we’d wander the city streets. Everywhere we looked, there was some statue or building face that amazed us with its beauty. 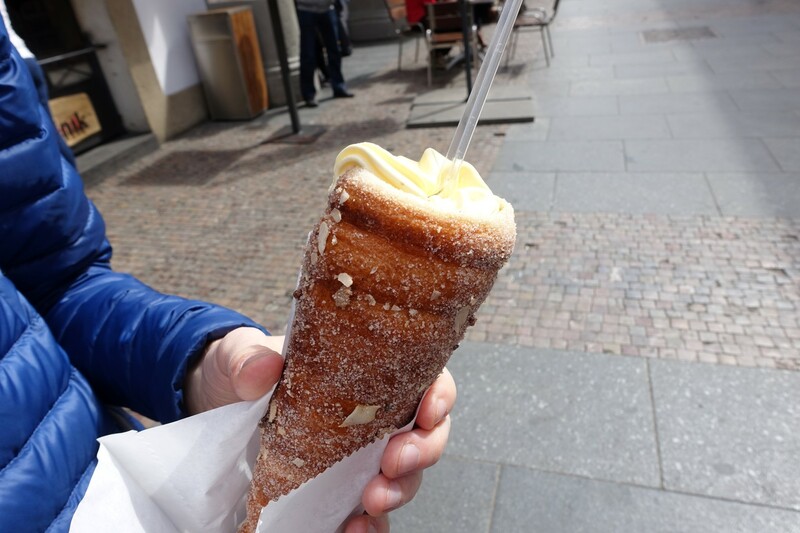 A trdlo (also called a Trdelník) pastry–cinnamon and sugar goodness with ice cream inside! Prague also had some delicious food (I know, how can one place have so many great things?!). We only went out to eat a few times, but every time our meals were hearty and so good. And don’t forget the Trdlo! A pastry cone thing covered in cinnamon and sugar, filled with ice cream or other delights. Yum! 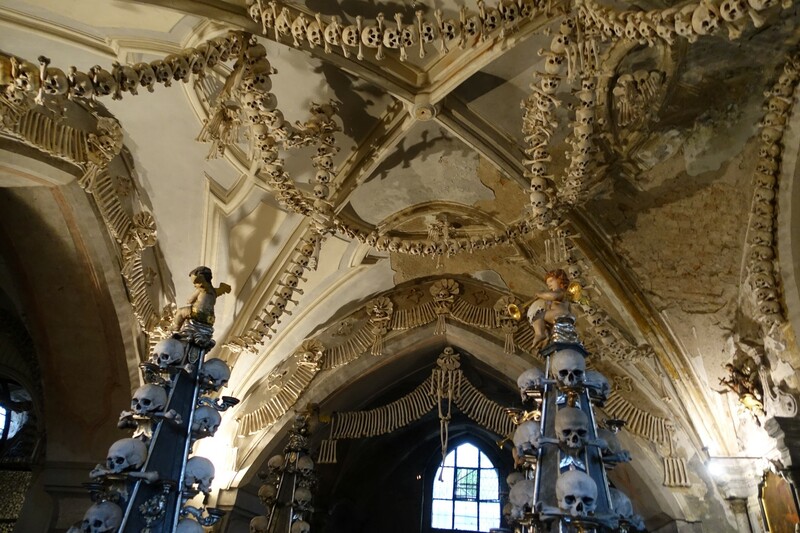 During our month in Prague, we took a quick little day trip to Kutna Hora, a smallish town less than an hour train ride away, and we visited the Sedlec Ossuary. Also known as the Bone Church. A coat of arms of bones! Though they should have just used radius and ulna bones, so that it’d be a bone coat of arms of arm bones. 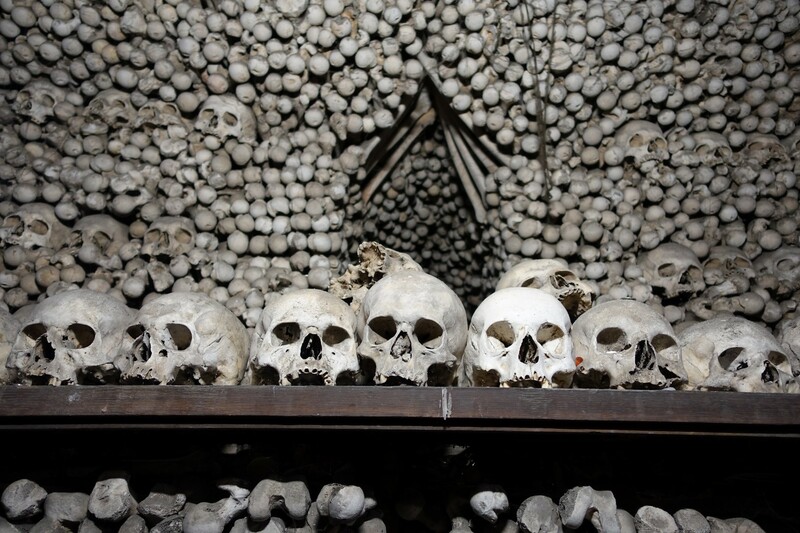 It’s called the Bone Church because of all those bones. Seriously, SO MANY bones. 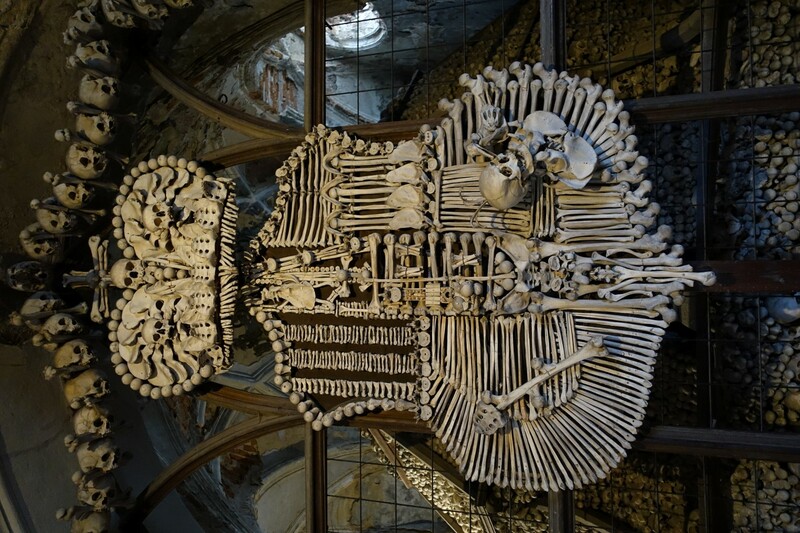 There are over 40,000 skeletons inside the church, some used as decorations on the ceiling, others to create a coat of arms on one of the walls, and most in giant organized mounds in each corner of building. Many of the skeletons came from victims of the Black Death, which was a crazy thing to think about as we stood surrounded by piles of bones and garlands of skulls. It was macabre for sure, but left us with a feeling of awe and an appreciation for our plague-free lives. Soooo manyyyy boneesssss… A good place to contemplate one’s mortality. During our last few days in Prague, Annabelle and I went on a tour of the Klementinum, an old university in the heart of the city. It included a visit to the top of an astronomical tower, where we got some great views, and a stop at one of the world’s most beautiful libraries. Pictures of the library weren’t allowed, and the ones I tried to surreptitiously take with my phone didn’t come out, so I don’t have any photos of it, but it was great. Elegant wood everywhere, painted ceilings, and, of course, lots of books. We were only allowed to look at it through a door, but that was enough. If I’d been allowed in, I might have cried. Prague is an amazing place for so many reasons, and we can’t help but list it as one of our favorite cities in the world. It will always hold a special place in our hearts. I lived in Prague for about seven years and dream every day about moving back. It’s where I met my wife and where our son was born. I’m so happy you managed to have such a great experience there.